Pune is at a distance of about 192kms away from Mumbai and the travel through the Western ghats is really a rewarding experience.Although Mumbai is the capital of Maharastra Pune ca boast of being the cradle of Marathi culture. Pune geographical location is such that the city lies between 18 degree 32' N latitude and 73 degree 51' E longitude. Situated near the western margin of the Deccan plateau, it stands bordered by hills on the east as well as the south. The great Maratha ruler Chhatrapati Shivaji during his reign around 17th century gave central importance to Pune.It was under the Peshwas characterized by readiness to embark on bold new ventures,Pune began to rose into a centre for a major political force.The Peshwas were eminent benefactor of arts and culture which led to the appreciation of temples, gardens and educational institutions.Pune played an important role in India's struggle for independence with the likes of Bal Gangadhar Tilak and Vinayak Damodar Savarkar dominating the political arena here.Later when Pune came under the control of East India Company,it became the town for the Indian Army and the British renamed it as Poona. This is celebrated in Maharashtra with most pomp and show.The birthday of Lord Ganesha is celebrated on this day.Large and small idols are worshipped and then taken into large procession to the waterfront for immersions. Each year, after a successful winter harvest, people get ready to welcome the spring with Holi - the festival of colors. Brightly colored powders are applied on faces, and there is plenty of music, dance and sweets to fill the rest of the day. The exuberant display of colors symbolizes the advent of a colorful and prosperous spring season. St. Mary's Church is situated on the Staveley Road of Pune. It is considered to be one of the oldest protestant churches in the city and was consecrated by Bishop Heber. 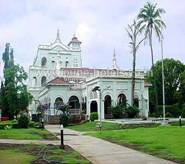 Pune St. Mary's Church was built mainly for the officers and soldiers of the British, along with their families, in the year 1825. This temple otherwisw known as Agiary is a temple for the Zoroastrians which is situated on Dastur Meher Road and was established by Sir Jamsetjee Jeejeebhoy in year 1844.The structure protects the Holy Fire and Sacred Holy Book (Atesh Adaran Saheb).The highlight of the temple is that the holy fire lighted on 1844 is still burning without turning off even once. 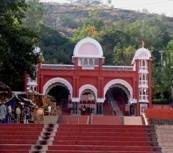 Chaturshringi temple is situated on a hillock near the Senapati Bapat Road. The temple dates back to the reign of Chatrapati Shivaji and is dedicated to Goddess Chatshrungee. This temple is dedicated to Lord Ganesha and is situated at a distance of about 26km from Pune.This is one of the Ashtavinayakas in Maharstra.This temple is nearly 400 years old. This temple is situated on the Jangali Maharaj Road in Shivaji Nagar and diety worshipped here is the God of the Underworld known as Lord Pateleshwar and the temple is famous for its rock-cut cave architecture. 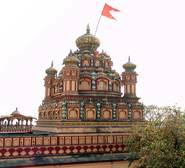 Omkareshwar temple is very renowned,belonging to the 17th century and is known for its magnificent stone structure.This temple is dedicated to Lord Goddess Parvati, wife of Lord Shiva and is situated on the banks of the Mutha river. Parvati Hill temple houses the deities of Lord Ganesha, Vishnu, Parvati, Kartikeya and Devadeshwar.One can get a beautiful view of the city from this temple.There is an adjoining museum that contains things of the contemporary society of the Peshwas.Artifacts include old manuscripts, weapons, replicas of ancient paintings and coins. Aga Khan Palace is quite famous for it was here where Gandhi and his wife Kasturba kept prisoned during Quit India Movement.It was built by Sultan Mohammed Shah, Aga Khan III in 1892 to mainly provide employment to the people of the nearby areas, who were hit by famine.This palace is situated in Yerwada. This located in Kasba Peth was the residence of the Peshawas which is a seven storeyed building.It is a fort, whose foundation was laid down by Peshwa Baji Rao in the year 1729-30. It took two years to complete the fort and later, many additions were also made to it by the successors of Baji Rao.The added attraction of Shaniwar Wada are fountains, courtyards, blooming gardens, offices, audience halls and residential quarters. Shindyanchi Chhatri situated in Wanowrie is known for its architecture.It is a memorial dedicated to the great soldier, Mahadji Shinde.The entire complex of the memorial also consists of a temple, dedicated to Lord Shiva, which was built by Mahadji himself,in the year 1794. This institute is very famous worldwide for it is from here where the finest film professionals of the country were graduated.A premier institute, FTII imparts training in all major branches of film training in all major branches of film making. This is a very famous academy for its is the only one of its kind in the world where all the three forces are trained together.The National Defense Academy,located at a distance of about 17kms from Pune is a premier Inter Service training institution where future officers of the Armed Forces are trained. Sinhagad or the “Lion Fort” is located at a distance of 25 kms from the Pune city. The fort is associated with Shivaji’s general Tanaji Malasure who died during the battle to occupy the fort for Shivaji. The history behind the name of this fort Sinhagad is that Shivaji when heard that his general was died he mourned and said that we have won the fort but lost the Lion. Osho Commune International is an ashram founded by Rajneesh Chandra Mohan Jain, popularly known as Osho. Situated in the Koregaon Park of Pune, Osho Ashram is mainly famous for the meditation courses it offers. Away from the hectic pace of city life, the ashram comes as a welcome relief for the people. Appu Ghar is situated at Pradhikaran, Nigdi on Pune-Bombay highway.This is an amusement park with lot of fun and water rides and is enjoyed by people of all age groups. This museum is situated near the railway station and it houses the artifacts and photographs of the tribal people of Maharashtra mainly from Sahyadri and Gondwana regions. This museum is dedicated to the father of Indian constitution Dr. Babsaheb Ambedkar who fought against caste discrimination.Babasaheb Ambedkar Museum has the display of things used by Ambedkar like chairs, utensils, clothes, foot wears and many other accessories. This museum has a collection of Mughal antiques which include paintings, instruments, lamps, pens and nut crackers etc. The most interesting piece is a Maharashtrian Chitrakathi scroll painting, used in folk theatre performances. 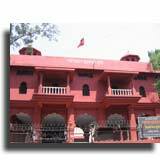 This museum is near Shivaji Nagar was initially referred as Lord Ray Museum which was started in 1890.It houses industrial products, agricultural and handicraft articles. The speciality of this museum is that you can see the samples of body structures of various animals. Bund Garden situated on the right bank of the Mula-Mutha Rivers is a famous tourist attraction.This was mainly built to provide the poor with water during hot months of the summers by Sir Jamshedji Jeejeebhoy.This park also provides boat and horse rides. Empress Garden was initially managed by the British government and is situated near the Pune Solapur Road. Peshwa Udyan Zoo houses a number of variety of wild animals, reptiles and birds and is of a major attraction to the tourist as well as to the people of Pune.Peshwa Udyan Zoo is situated near Saras Baug., is one of the major tourist attractions of Pune. 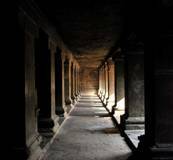 Saras Baug lies at a distance of approximately one kilometer from Swargate, Pune. The lush green lawns of the Baug, along with its blooming flowerbeds, attract tourist from far and wide. 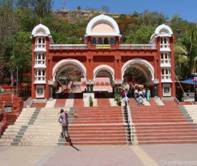 Pune Saras Baug is also quite famous for the Ganapati temple situated inside its premises. This park was established in the year 1986 an is situated at a distance of about 8 km away from the city on the Pune-Satara Highway.This snake park is maintained by Pune Municipal Corporation. Katraj Garden is adjacent to the snake park and people mainly come here for the serenity and tranquility of this area.It also entertains the visitors with boat rides in the lake nearby. Sambhaji Park is situated on the Jangali Maharaj Road, at a distance of just one km from the Deccan Gymkhana. The park is famous for its fish aquarium, a small fort for kids and a magnificent fountain. Deccan Gymkhana - suiting, shirting, toys, steel and plastic articles, embroidery items, etc. Fashion Street - The market consists of around 450 stalls, in toto, and is a multi-purpose shopping place. Here you can get anything, ranging from clothes to footwear. Tulsi Baug - Gift items, household items, metalware, etc here. Mahatma Phule Mandai - Fresh vegetables, fruits and puja items. The excellent road network connects Pune with most of the important cities in Maharashtra and India. The Mumbai-Pune Express Highway offers a safe and fast access between Mumbai and Pune. Pune is also well connected with Goa, Ahmedabad, Nagpur, Shirdi, Bangalore, Indore, Hyderabad and Aurangabad through road. Pune city has its own airport, which lies in the Lohagaon area. The airport is situated at a distance of approximately 10 km to the northeast of the city. It is serviced by almost all the public as well as private airlines of India. Pune has regular flights to all the key cities in India, like Delhi, Mumbai, Chennai, Hyderabad, etc. Infact, since quite sometime, you can even get direct flights from Pune to Dubai and Singapore. Pune is an important railway junction in Indian railway. Good rail networks connect Pune with all other rail junctions in India.